The Bank of England, the UK’s central bank, said it prefers to concentrate its stress test on major retail banks, which account for about 80% of all lending in the country. Smaller lenders and British units of foreign-owned banks will not be subjected to its annual stress tests, the BoE (Bank of England) announced on Wednesday. 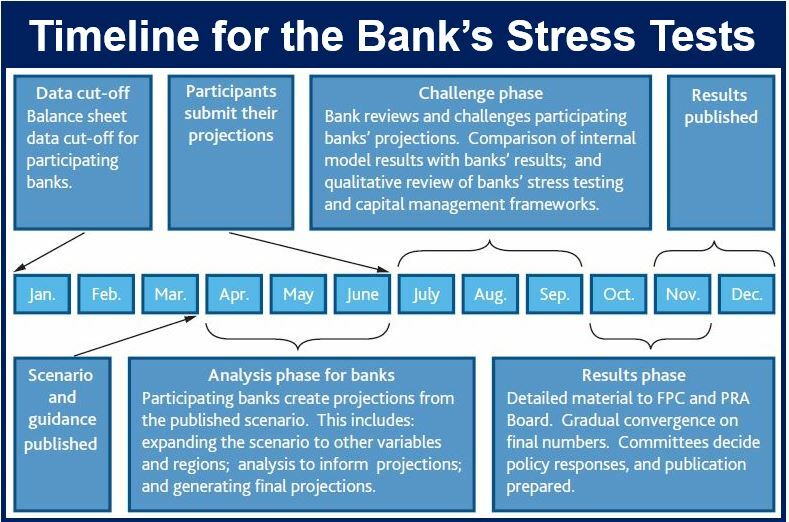 A bank stress test determines how well a bank can withstand a financial crisis such as the one that struck the world in 2007/8 – through an analysis or simulation of potentially catastrophic events. The central bank published its approach to stress testing the British banking system (citation below), which aims to provide clarity of firms and wider public about its plans for stress testing until 2018. – The implementation of a yearly cyclical scenario which will link the severity of the test to the financial cycle automatically. This scenario will include international, domestic and market elements. Its severity will probably be greater in an upswing, for example, when credit growth is rapid or asset prices are abnormally high. – A two-yearly exploratory scenario that covers risks unrelated to the financial cycle that policymakers believe are emerging, or latent threats to individual banks or overall financial stability. – A framework consisting of transparent hurdle rates clearly laid out for each company, reflecting minimum capital requirements and further requirements for globally systemic banks. – The stress test will only include financial institutions with total retail deposits exceeding £50 billion. For the moment, this covers the same companies as those included in the 2015 stress test. Citation: “The Bank of England’s approach to stress testing the UK banking system,” Bank of England. October 2015. Video – What is Stress Testing? This short film explains the Bank of England’s approach to stress testing UK banks.